Living Springs offers Activated Hydrogen Structured Water Technologies for whole-house water treatment, personal travel products and for agricultural and industrial applications. Inspired by nature, Living Springs is dedicated to enhancing water’s natural benefits with minerals and the natural movement that nature uses to revitalize this vital and sacred resource. I first came into contact with Living Springs Water at the 2016 Expo West Convention. I met the owner Aziz Patel who is very passionate about providing clean and HEALTHY water to our community. Their water technology has real science behind it and revitalizes the life force in your water, Hydrogen. Living Springs offers Structured Water Units for your home and also has a Personal Products line for your water on the go. Inspired by Nature, Living Springs is dedicated to enhancing water’s natural benefits with minerals and the natural movement that nature uses thus providing fresh mountain spring water to your home or office. Finally water that not only tastes amazing, but hydrates too. Living Springs Water provides Residential Structured Water Units that are designed to create activated hydrogen structured water for your home. They offer 3 different tiers of in home systems stylized to accommodate any preference. Imagine having great tasting and hydrating water from every faucet and shower in your home. In nature, mountain streams collect energy and trace minerals and nutrients, soil and vegetation while it dances over and around rocks . This process creates the energy needed to sustain the life in water. You can learn more about their Residential Products & advanced home water filtration systems by clicking here. 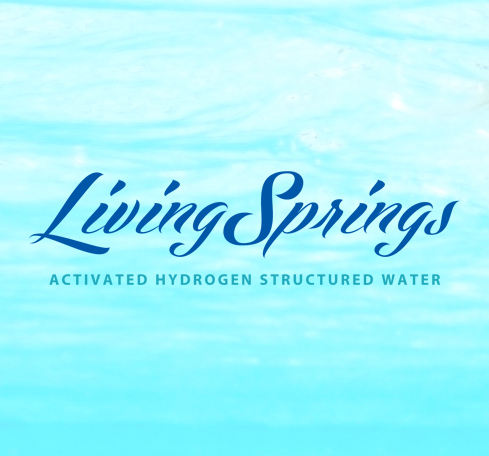 Living Springs Water also carries Personal activated hydrogen structured water products that are designed to give you optimum hydration on the go. Activate and invigorate any bottled, filtered or tap water. You will find three different personal products on their website, that will allow you to structure your water where ever you are by creating oxygen rich, active hydrogen, healthier and more nourishing water – just the way nature intends. You can learn more about their Personal Products by clicking here. #1 – What are the basics? We all know drinking 8 glasses a day is important, but is it enough? I have found that it is not the quantity of the water we consume daily, but the “quality” of the water. Drinking 8 glasses of water may or may not be enough depending on quality or ability to provide “intra” cellular hydration. Today the right kind of water makes all the difference. As an Ecotarian we understand that water is a “living thing in a liquid form”. The sacred element that we as humans and all living things are made of. The element that supports basic life and optimal health, but what if water is now only supporting basic life and not optimum health? What if we couldn’t see the difference between water that supports life and water that supports health? #2 – Why has water lost its integrity? We are made of water and anytime we do something to water we must consider if we would like it done to ourselves. Boiling, freezing, piping long distances are all things that would not make us happy. In fact they would nearly or certainly kill us. Water is the same way. We must bring water back to a healthy state as nature intended… “pristine living mountain spring water”. Think of it like this… when we harvest grapes we take them from their natural environment and they begins to lose their nutritional value and energy. Water is very similar… we harvest it from its natural environment of a river where it has its highest nutritional value and energy. This energy is what helps the water molecule access the cell wall and provide “intra” cellular hydration It then begins to lose that energy or nutritional value once it is taken out of it natural environment and thus its ability to hydrate at the “intra” cellular level. That is waters nutritional value… its energy which in science is an “algorithm”. That mathematical algorithm is the key to hydrating at the “intro” cellular level, not minerals, or purified or its ability to be alkaline, acidic or ionized. Waters true value comes from the fact if it can provide “intra” cellular hydration which is due to its energy, which is held within hydrogen bonds. #3 – The different types of “better quality” water systems out there? KangenTM is one of many alkaline otherwise known as ionized water systems for better or worse which create what some call alkaline or hydrogenated water. These systems produce alkaline and acidic water by what is known as an ionization process which creates hydrogen rich water. The purpose of having more hydrogen in water is that hydrogen is the strongest anti-oxidant known to us and the more hydrogen your water has the stronger the anti-oxidant value your water will have, but that doesn’t make it any more hydrating. These systems are designed to create alkaline water for drinking and acidic water for cleaning. That is the general use of the two different waters they produce. As soon as we can relate to the idea of being an Ecotarian we begin to understand the nature of our being and benefit of here is that the more hydrogen that is created the more the anti-oxidant value your water will have, however, this is an unnatural process and will not created water in its natural state. The purpose of having more hydrogen in water is that hydrogen is an anti-oxidant and the more hydrogen your water has the more anti-oxidation your body will receive. Water that is in its natural state is water that is the most hydrating. Ionization processes like KangenTM ionizers use electricity to split the water molecule thus creating alkaline and acidic water. This is a very unnatural process and does not create “pristine natural mountain spring water” which is water at its most hydrating property. As Ecotarians we understand that the planet, the body and water are physics. This is the science of the new science of the planet, our future and water. In water it is called structuring. Structuring or revitalizing water is the science of bringing water back to its true nature intended state of “pristine living mountain spring water” this is “the new science of water”. This is also an interesting area where science and nature truly meet. For water to be in its natural state it must be in its natural environment like a river or spring. That is where it has the most energy and is in its highest natural living form with it ability to hydrate at its highest potential. In order to understand the structure of water an Ecotarian understands that “water is a living thing in a liquid form” we understand that the sturcture of water consists of the many different ways that water moves in a spring and the minerals it comes into contact with that gives water it ability to support optimal hydration and health turning it into pristine living mountain spring water. There are also additional external forces such as direct sunlight, temperature and time of day that also effect waters natural behavior and potential for optimal hydration. In order to understand how water is a you are a multiple of different movements in water that effect the quality of its structured properties. #4 – Why Structured Water is the most important & how it differs from Kangen / Alkaline water? Understanding the difference between water filtration, structured water systems and alkaline systems such a Kangen ionizers, Ecotarians must examine the science and processes that perform the purification and alkaline and structured water functions and treatments as well as the people or companies that created them. To understand water we must look closer. What is water systems and processes made of? To start as basic chemistry explains… water is made of H2O. 2 hydrogen atoms and 1 oxygen atom, but what holds those atoms together to make H2O is quite a unique concept… it’s Energy! But what and where is this energy stored? There is a science that can explain this and it is called quantum physics. By applying quantum physics combined with biochemistry scientists were able to measurably identify the mathematical formula or algorithm of every movement and chemical reaction in order to replicate a living spring inside of a pipe so that you could get “pristine living mountain spring water” at your entire homes faucets or showers. Imagine bathing or showering in mountain springs water. There are many types of structured water products on the market world wide claiming to be able to revitalize water back to its nature intended state… pristine living mountain spring water. on the market. Most of these products are simple vortex pipes or magnets. Or the combination of the two combined with filtration and perhaps a mineral cartridge putting minerals back into the water. Ultimately, it is the COMBINATION of the different movememts of water that give water its optimum energy i.e. ability to hydrate. While attending the Natural Products Expo West this year a friend introduced me to Aziz Patel the President and CEO of Living Springs water. Living Springs brings a whole new breath to the structuring and revitalization of water back to it nature intended state. Living Springs takes water beyond filtration or purification to another step and puts it thru a proprietary process which brings water back to life. The technology took over 12 years 100’s of millions in research and development with a collaboration of world renouned water experts and scientists. This technology strictly address waters ability to hydrate at the “intra” cellular level thus providing optimal hydration. Living Springs Water provides Residential Structured Water Units that are designed to create activated hydrogen structured water for your home. They offer 3 different tiers of in home systems stylized to accommodate any preference. Imagine having great tasting and hydrating water from every faucet and shower in your home. In nature, mountain streams collect energy and trace minerals and nutrients while it dances over and around rocks. This process creates the energy needed to sustain the lifeforce in water.